Who is Tayet and what has She got to do with Isis? In Isis Magic, the “Ritual of Becoming the Beloved of Isis,” the initiatory rite for the Prophetess or Prophet of Isis, involves three priestesses who takes the roles of Isis, Nephthys, and Tayet. Why is Tayet—a much less well known Goddess than either Isis or Nephthys—part of this important ritual? In the rite, the prospective prophetess or prophet symbolically dies, is mummy wrapped, and is eventually reborn as the Beloved of Isis. Since Tayet is the Linen Goddess Who weaves the mummy wrappings, it is fitting that Her priestess be part of the rebirthing. Yet the connection between Isis and Tayet is more interesting than that. 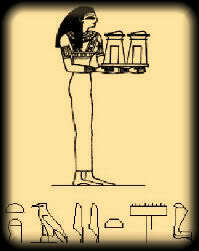 As is true of many of the Egyptian Deities, scholars are unsure as to the origins of the worship of Tayet. Judging by Her name alone, it may be that She was first worshipped in the lower Egyptian “weaving town” of Tayet. As far as I can tell, the town itself has not been found, just written references to it. Later, Tayet was an alternate name for Buto in the lower Egyptian delta…so it may be that the weaving town of the inscriptions was actually Buto from the beginning. 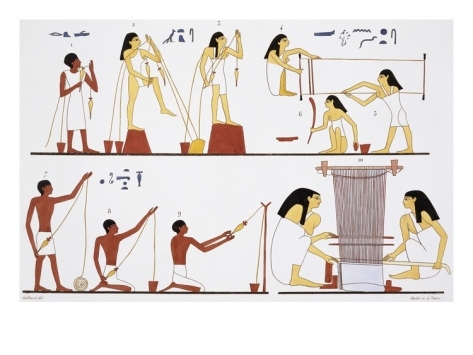 Indeed, the first evidence of Egyptian weaving comes to us from lower Egypt during the Neolithic period. An inscription from the much later temple of Hathor in Denderah says that Tayet was born in Denderah. Yet the Denderah shrine in which this inscription occurs bears the name of a shrine in Buto, and so it makes a good deal of sense to continue to strongly connect Tayet with Buto. Also interesting is the fact that Isis’ temple at Isiopolis makes much of Her connection with the kite, or djeret. So we have three Goddesses—all three connected with the kite, with weaving, with rebirth of the dead—and also with purification. Old Kingdom texts refer to a woman called the Kite who was the pharaoh’s chief female funerary attendant and who was supposed to “remove poisons” from the deceased. 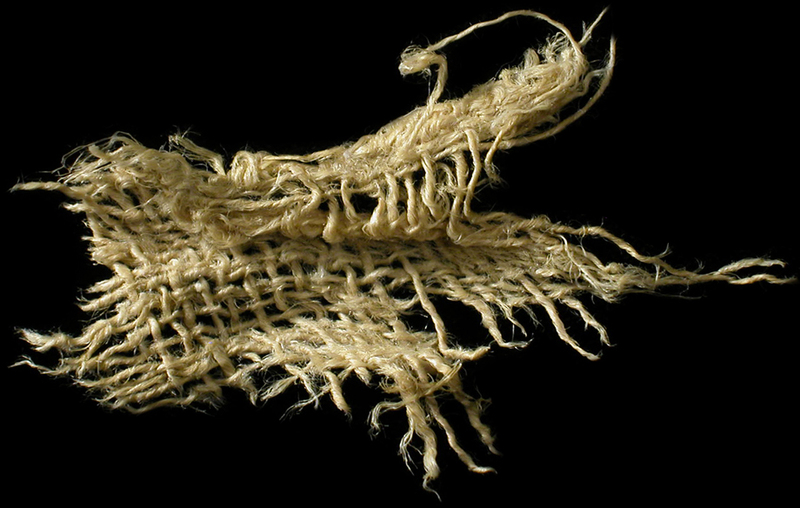 The linen itself is considered to be divinely pure: An ancient Egyptian medical spell meant to prevent bleeding, warns against “treading on what is pure, the land of Tayet.” In other words, the spell is intended to keep blood from seeping from the wound and staining the pure bandage woven by the hand of the Goddess Herself. The purificatory role of Kite was sometimes associated with Tayet; at other times, two women ritualists were designated as Kites and connected with Isis and Nephthys. In addition to Their role in purification, the Divine Kites were responsible for ferrying the pharaoh—and Osiris—to the otherworld. The first pictorial representation of Tayet that we have left to us is from the Osiris chapel at Karnak. She is shown as a human woman holding two pieces of cloth and facing Isis and Osiris. At Denderah, She is shown a number of times, including some instances in which She is specifically connected with Isis. By the New Kingdom, we find the hyphenated Goddess Isis-Tayet. At Kom Ombo, Tayet’s image is portrayed in a vestibule of the Birth House. So, like both Isis and Nephthys, Tayet is connected with coming into and going out of life. At Denderah, Tayet is said to have been born with green skin. This may be a reference to the green and growing flax from which linen will eventually be made, for She is also said to be pale in complexion, like the white linen once the process is complete. On the other hand, Tayet may be green-faced for the same reason that both Isis and Osiris (and I think I recall a green Serket as well) are sometimes portrayed as green-faced. They are green because They are Deities associated with rebirth; They are the Living, Green Ones of the Other world; They promote each person’s rebirth like the new green shoots of plants in the fields. Tayet is said to be the wife of Nepri, the young God associated with growing grain and Whom Osiris, in His rebirth, is said to Become. And let us not forget that more than cloth was woven in ancient Egypt. 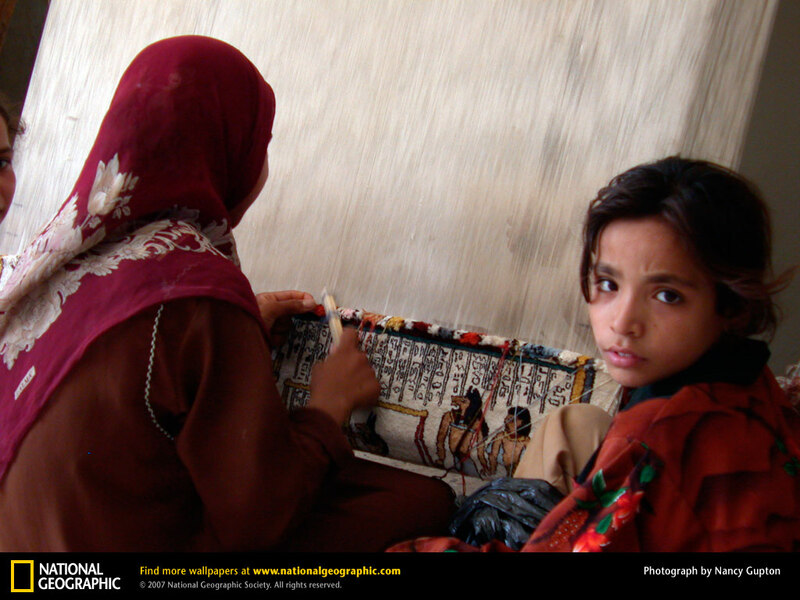 Magic was also a woven thing and weaving was one of the key methods for working magic. An ancient formula to cure a poisoned cat says that Isis has “spun something” and Nephthys has “woven something” against the poison. Numerous funerary texts say that magic is knit or woven around the deceased. The dead person is “knit together in the egg” prior to rebirth, or her head is “knit on” by the Deities. Many modern magic workers would agree that the joining together of the threads of energy that are one mechanism of magic can be aptly described by actions such as weaving and knitting. This idea can also be related to Egyptian knot magic in which the surrounding or encircling of the two ends of the knot creates the magic circle or egg within which the threads of magic are then woven to create a blanket of creative, healing, and renewing energy. I find Tayet strangely compelling. For a Goddess with so little specific myth, She seems to me to cast a very large shadow—or better still, a large aura. It is almost like She is the Third Sister, joining Isis and Nephthys in all Their majesty. That’s why you will see Her showing up in a number of the rites in Isis Magic. She continues to intrigue me, though I can never quite get a full sense of Her. If you’ve had any contact with Tayet, I hope you’ll share it. In the meantime, may She and Her Two (adopted?) Sisters bless you. Previous Previous post: What’s all this about Horus being born on Dec. 25?